Light rail involves huge capital and operating costs and many years of construction and will carry passengers between only a few fixed-point stations. Bus or bus rapid-transit will take more passengers to more destinations for far less money, without the lengthy construction period. In less than 600 words, Mr. Van Dyk goes from rejoicing over the defeat of a measure in which Seattle would have spent almost three times more on BRT-type improvements as rail, to whining that bus rapid transit is much more effective than trains. Rail advocates have few greater allies than friends of BRT like these. Except for some HOV freeway expresses, in any actual user’s experience buses are slow and unreliable. By refusing to support even halting moves towards making buses better, they fatally tarnish the bus brand. Bus rail/arguments, at least around here, often turn in to some sort of engineering throughput exercise. And it’s true that aside from smoothness of ride and capacity,* you can theoretically do just as much with a bus in a tunnel or on a busway as with a train in a similar environment, and possibly do it a bit cheaper. It’s a lot cheaper if you already have the bus lane, which is generally not the case in the densest areas. But these arguments always fall down in that they’re comparing a theoretical bus to an actual train proposal. To the casual voter, bus service means indeterminate frequency and span, being stuck in traffic, and unreliable service. Trains around the world are the opposite of these, and the brand sticks. I don’t think STB’s commitment to making the bus more BRT-like can seriously be in doubt, but it’s a hard political road, and the Ted Van Dyks of the world aren’t helping. Meanwhile, ST has had similar budget problems, but Central Link is still running as frequently as ever. They’ve had to cut the scope of lines and cut bus service, but (aside from real-time information, apparently) they haven’t cut the quality features of Link we’ve come to expect. Maybe that’s the culture of the agency, maybe it’s something about marginal costs of rail features, or maybe it’s the spotlight that comes with a multibillion dollar capital project. In any case, it’s why I’m glad there’s a rail line running through my neighborhood instead of a BRT one. * That’s not to say that capacity doesn’t matter! ** And I like RapidRide and Swift! But they’re not Link. …NOT if you create BUS LANES! You expected intelligent, high-quality analysis from Crosscut? You’ve been around long enough to know that just ain’t so, Martin. In defense of the cuts to SWIFT, I think CT made the right choice under the circumstances, particularly with the Sunday cuts. Sunday is always the weakest ridership day on any system, and with no connecting service and limited demand, ridership would have been terrible. Moreover, CT saves money by being able to simply turn off the lights for a day, so those Sunday platform hours would have cost more than the same number of platform hours any other day of the week. If you want to see BRT gutted by cuts consider Phoenix’s METRO LINK: two busses per hour midday weekday (the headways don’t even line up correctly for 30-minute service). To be fair, they also cut METRO RAIL headways from 10/15 to 12/20, but still, their “BRT” service is so infrequent as to not be worth the name. Taking away Sunday service is a huge take-away for the bus dependant, regardless of ridership relative to weekday peak. I’m sure the number of car-free adults in Snohomish County has dwindled to near non-existence because of this move. The move makes financial sense for Snohomish County only because they no longer have to take DART passengers to dialysis on Sundays. That is what results from the perverse incentives built into ADA. I suspect the number of voluntarily carless working-age adults in SnoCo was infinitesimal before this change. It also makes financial sense because it allows CT to shut down their operations base on Sundays. Keeping even one CT-operated route in operation means the base has to be staffed. The ST routes are operated by First Transit, so the CT base can be shut down even when the 512 is in service. I’m one of those people who chooses to use transit in Snohomish County. There are others. For my personal needs I really wanted the Swift to run on Sundays as it goes within 3/4 of a mile of my house. An easy solution to CT being shut down is to let Everett Transit run it on Sundays. It was supposed to be an ET/CT venture anyway. For those of us in Snohomish County it’s really difficult to be completely surrounded by transit companies running on Sunday but not be able to go anywhere. Someone who lives in Olympia can get to the Mukilteo ferry dock on Sunday but someone who lives in Mukilteo can’t. Crazy. I remain amazed that there is still no all-day express bus connection to SWIFT, unless you count the 510 and 513 to the north terminus. Wouldn’t it make sense to have the 511 head to Hwy 99 after reaching Lynnwood P&R, to make that connection, instead of serving an additional minor P&R as its terminus? If CT were to restore SWIFT on Sundays, it wouldn’t have to run DART for all of its service area on Sundays. It would just have to run DART to locations within the required distance from the SWIFT line. Then, run the 511 (altered to serve 99) instead of the 512. All the stops north of Lynnwood, except in downtown Everett, are P&Rs anyway. This would help develop the ridership pattern that would point North Link toward 99 instead of just serving a series of P&Rs along I-5. Crosscut, like most sites, has poorly argued garbage but also some really informative articles. It’s just that this piece is a wonderful illustration of BRT pseudo-advocacy. I understand the reasoning behind CT cutting Sunday service, and in fact said “for better or for worse” because I wasn’t making a judgement. But at some point you have to make a commitment that a transit line is going to always be there for you, frequently and almost all-day, and that seems a lot easier to do with rail for reasons that have little to do with engineering or math. But the reasons are about math. And that’s why they are not widely comprehended. Tell the average voter on the street that transit lanes and traffic signal transit priority are revenue positive because it then takes fewer buses and fewer operators to provide the same headway, and they’ll just give you a blank stare. I can count of the fingers of one hand the number of really informative articles I’ve read on Crosscut. But I digress. I would dispute the importance of seven day a week frequent service to some extent — I think the difference is alignment, and how much exclusive ROW a line has. Consider San Diego’s trolley system, the biggest light rail system in the country by ridership. Most of its lines run every 30 minutes after 8 PM and on Sunday. In spite of that, the trolley system is successful because it isn’t bogged down by traffic, it directly connects urban centers and ridership destinations, its route structure is simple, and it’s prominent and well-branded. It’s also worth noting that METRO RAIL this year almost broke its 2020 ridership predictions, in spite of cutting headways as I described above; I think this happened for the same reason as San Diego, it’s a well-chosen alignment. Wikipedia suggests that San Diego is #6, behind the light rail components of four mixed-technology systems (Boston, LA, SF, Philadelphia) and Portland. In any case, there are certainly examples around the world of rail that doesn’t live up to brand expectations: San Diego, Marseilles, and streetcars just about anywhere. But to date they haven’t yet damaged people’s expectations of what a rail line will be, at least when it’s not branded as a streetcar. Fair enough. I guess my main point was that getting the alignment and traffic-independence of trunk lines right seems more important to me than anything else, and it’s something we have not done very well in Seattle so far. We certainly agree about your critique of the substance of the Crosscut article. Your justification of Sunday cuts is one-dimensional and isn’t comprehensive. Also, a four car LINK light rail train, requiring only one operator, is how much longer than 60 feet and can carry how many more passengers than an articulated bus? Does anyone know whether the outer lanes on Aurora will be converted to HOV or transit lanes before the opening of the E Line? Same question for the new Broadway Street Car. The First Hill Street Car will not have any exclusive right of way for any significant part of its alignment. I don’t know if Aurora will get a whole lot more BAT lanes due to RapidRide E, although there’s quite a bit there now. I’m currently trying to find more info on this subject, although it might still be that no-one knows, as everyone at Metro is still working on RR C & D.
Broadway is actually two lanes in each direction much of its length. It just happens that there are parked cars sitting in one of those lanes. Has nobody suggested removing parking in order to give the streetcar a dedicated lane? I think the streetcar will operate better with single lane operations than most people expect. Certainly not the same at exclusive ROW but better than buses on Broadway do now. The major issues will be at intersections where right turning traffic, waiting for pedestrians, then blocks the streetcar. At high right turning volume locations, Pine for example, a right turn lane would solve a good amount of this problem. I don’t know if any other intersections will get this treatment. Left turns will be less of an issues because I believe left turns will be restricted or there will be a left turn pocket provided. Giving pedestrians their own signal phase like at 1st & Pike, 1st & University, or at Bellevue Transit Center where there is a high volume of turnIng traffic or pedestrians can help with traffic flow, pedestrian movement, and pedestrian safety. So, if the City were to propose an all-BRT transit measure, would Ted support it? Probably not… because that involves raising taxes. Well said. I think most of us would like to see BRT-type improvements around a lot of the system, but the Ted Van Dyks of the world never help that happen. Generally, people who want BRT are people who want trains even more, and so they advocate for trains. People who actually advocate for BRT are people who really just don’t want to spend money trains. But they also would rather not spend money on BRT, so their BRT advocacy never gets followed through. I’m about 75% convinced that John Niles would actually like to see BRT happen. Doug McDonald might also be sincere. But I think they’re the exceptions. I don’t know about John Niles, but I think I know Mr. McDonald well enough to know he is 100% sincere in his support for bus service. John is all about the private automobile, vanpools, telecommuting, and possibly congestion pricing. I’ve never heard any serious detailed talk about BRT or any other buses from him, other than vague “buses can do it better/cheaper” type statements. I’m happy to be proven wrong though – John? My summary views on BRT are documented a recent paper I wrote as a Research Associate at Mineta Transportation Institute, San Jose State University, posted at http://www.globaltelematics.com/brt/index.htm . There is a followup paper funded by Federal Transit Administration that isn’t posted yet. This is quite good, John. It shows the various components and “flavors” of various BRT systems. This link speaks to the “buses can do it better/cheaper” type statements that I refer to and that’s good stuff. A lot of us here are talking up ideas to make our existing transportation system more efficient. But at the heart of it, I still view your work through the prism of somebody talking buses only to use them as a weapon against light rail. Given the heavy emphasis of BRT vs. Rail on your site, that seems pretty obvious. Again, feel free to prove me wrong, but until I see otherwise I’ll view your materials skeptically since I am not convinced you have any interest in expanding public transportation. Making more efficient use of what we have? Yes. Expanding and giving people choices other than the personal automobile, no. Where would I go to see the link to your work supporting these comprehensive ideas? Ideological arguments on technical matters don’t have to be very long. Very few “BRT” proponents can go a single round on specifics. Good instance: for the 21 years since the opening of the Downtown Seattle Transit Tunnel, I-5 service has been crying for a southbound afternoon transit lane between Northgate and Convention Place. Some structural modifications would have to be made on elevated structures, and, like every transit corridor, someone would have to make the political decision to convert general traffic lanes to transit. I doubt either Ted or or John would go with me to Olympia or to the ballot to lobby for this- so end of discussion. As a former driver and current full-time passenger, I really do hate the assumption that bus service is supposed to be slow, especially in the minds of transit officials. “Well, KC Metro got me here!” doesn’t cut much ice with employers if you’re late for work. “If one says A, one must say B” is an annoying rhetorical argument that probably reads better in German. But for me, anybody who says BRT has to finish the sentence with fully-reserved lanes and signal pre-empt. Otherwise…I’ve got a bus to catch. Isn’t this exactly the situation with LRT across I-90? The buses crossing the bridge naturally want to fan out to serve a variety of urban destinations, rather than have all that capacity try to serve a few key station locations on the Eastside. BRT makes sense, as the lanes across the bridge can be used for car and van pools, further increasing the effectiveness of the ROW. Ah, but that train has left the station. End of debate. Now we all get to wait until 2023 to start the agony of monthly ridership numbers to see who was right, which by then it won’t matter much, as the ‘the voters spoke’ in 2008. You are aware that the overwhelming generators of cross-lake transit ridership via I-90 are Bellevue CBD and the Eastgate/Issaquah I-90 corridor, right? Not exactly dispersed destinations. ref. to O/D data please. Eastgate/Issaquah has no way to access the light rail line without a timely transfer at the S.Bellevue P/R and no provisions in the design were made to extend the line beyond there. Issaquah/Renton Highlands/Factoria/Eastgate all make my sub-point. The bigger point was…. It doesn’t matter anymore! The strongest demand for all of these destinations is during the peak, when Metro will continue to operate even after East Link opens. As you say, Eastgate/Issaquah will have connecting service at South Bellevue, at least during the mid-day I conjecture. Factoria doesn’t even have direct service to Seattle except during the reverse-peak. There’s no demand to the Renton Highlands outside of when the 111/114 runs. My point is just that– a few peak trips doesn’t stack up to the demand between Seattle and Bellevue CBDs. It doesn’t make sense to run BRT to all of these destinations any more than the service that is already there. This is such a great explanation – thanks for the post, and excellent work! Except for some HOV freeway expresses, in any actual user’s experience buses are slow and unreliable. I think that many of those HOV freeway buses qualify as BRT. At very least the 545 does once it gets on the freeway. If those don’t qualify as BRT, then you have an entirely unrealistic expectation of what BRT is, and that may, in fact, be the explanation for the “sincerity gap” you perceive. BRT has, of course, a “dynamic” definition, and I don’t want to go to war over semantics. In comparison to Link, though, I don’t think it’s “entirely unrealistic” to hope for off-board payment on a bus line with limited stops. Furthermore, in general, ST Express routes suffer from at least one of (a) headways that are too long to be effortless, (b) significant segments running in general traffic, or (c) an HOV lane that’s hopelessly clogged. Beyond that, freeway service is the easy part. The really expensive (and most valuable) parts of Link are the parts where freeway ROW won’t help you. Sorry I misspoke, I meant unrealistic expectations on the conversation, not unrealistic expectations on BRT. My point is that you likely have very very different ideas of what BRT compare to Ted Van Dyk. This is almost certainly true when you insist that BRT’s definition must include a “dynamic” portion, and that express bus service like the 545 fails the definition of BRT. I think that many BRT proponents would disagree with you, and when you say “you are not wholly sincere about your support of BRT because what you support doesn’t meet these criteria”, it could be the support or the criteria that is the problem. Also, if the freeway part was easy, why is Sound Transit spending tens of millions, over and over again, on free way stations and off-ramps such as the one in Mountlake Terrace, the ones on 405, the ones on I-90? That’s a very strange definition of “easy” to me. Let’s assume that Mr. Van Dyk’s definition of BRT is minimal, amounting to a few priority treatments here and there. He certainly didn’t support the Sound Move measure that funded the 545 and all those freeway ramps, and he didn’t support this month’s VLF even though it spent the largest chunk of its budget on the same kind of improvements. So what BRT-type improvements does he support? The freeway ramps are a lot easier than building a tunnel under Capitol Hill and the University. They’re an expedient way to speed things up without really serving the dense neighborhoods. You’re probably right about TVD. I am just saying there’s room in the argument. Thanks for that concession. I’m not suggesting that you have to support copying the LA Orange Line or Curitiba to be a BRT advocate, although a lot of advocates point to those as a way to approach the service quality of rail. But I’m not seeing a lot of the “buses can do it cheaper” crowd (with one or two honorable exceptions) showing up for even minimal bus improvements on the table. I will say I’m 100% with you on the main point, which is that it’s insincere to say “I support BRT over rail, because rail is expensive and BRT is magic” but to the not do anything when the chance to actual advocate BRT rolls around. In this sense, at least Tim Eyman is logically consistent. He doesn’t support rail, buses or roads. But someone making bad arguments about rail, brt and roads and then not actually backing them up with actions, that’s insincere. At least one BRT advocate (me) volunteered for prop 1. If it had any chance of passing I would have been happy to do more. If the city puts a Madison BRT line on the ballot you will definitely see more of me. The problem with BRT is that it takes political will to redirect general purpose lanes to transit. Otherwise it won’t be that effective. Unfortunately I don’t see a lot of will on the city council. A point-to-point highway express bus bears no more resemblance to a “rapid transit” line than does a scheduled helicopter flight. There is literally nothing else to say on the subject. d.p., that may have been one of the most glib comments I’ve ever seen here. The 545 gets what, 7000 riders per day? If that doesn’t make different from a helicopter flight in your mind, you might want to get your head checked. Yup. 7000 get on or off downtown. 7000 get on or off at Microsoft. That’s a shuttle. Not rapid transit. It’s certainly more efficient to run that shuttle in HOV lanes on highways than to run it with a fleet of helicopters, but the effect is no different. If BRT is to be argued as “rapid transit” in any expected sense of the term, it has to be useful for more than just bouncing between two disparate points. This is not what rapid transit looks like. And neither are highway buses. So if Link makes the same MS to DT shuttle it’s rapid transit even though it takes 7 minutes longer? Contrast this with the 545, where about 30 people get on at Capitol Hill, and then 30 people get off at NE 40th. Personally, I think the 545 is great. Most of its riders could easily afford to drive, and yet we take the bus, because it’s just that convenient. But it’s an express, not a rapid. I know I was being glib/a jerk earlier, and I also think a scheduled express shuttle like the 545 is a perfectly fine thing to have in the world. But when you start claiming such a thing as a legitimate definition of rapid transit, and consequently start envisioning a system built around such a definition, you do real damage to your transit mobility and to the very concept of public transport as a sustainable option. Let’s parse the 545. Forget about claiming it as a bi-directional corridor-based service to Redmond: the 10-minute Overlake detour on the way back eradicates any resemblance it might have had to “rapid” through-service. Forget about the useless and unused Evergreen Point and 92nd flyover stops. You could make a case that the Montlake flyover, with it’s direct street access and local bus transfers, provides a rapid-transit-like connection. But that one’s going away! The 545 passes just a mile from downtown Bellevue. Can you use the 545, in any way, to get there? The answer is no. 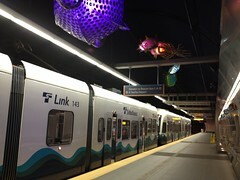 If the 545 were any form of rapid transit, you would be able to switch at Bellevue Way (the closest logical point) between it and a connecting service that would cover the last mile. Each would be the primary service on its respective corridor, and each would be frequent enough that making such a connection would be the obvious choice. But there’s no flyover stop at Bellevue way. In fact, the 545 blows right past central Bellevue, not stopping at all for 5 miles. If I want to get to downtown Bellevue, the 545 is useless to me , even if I’m standing at a major 545 stop like Overlake or Montlake. I have to take a totally different (and likely a less frequent and convenient) service. The 545’s service hours are wasted on me; it doesn’t even exist for me. No rapid transit system on earth would act like this. Highway lanes are not BRT. I wouldn’t really call the but routes themselves BRT, I would call the routes express buses, which run in a partial freeway based BRT corridor. This is because the large investments made in express operations are oriented toward peak direction travel (not full priority for reverse peak) and priority doesn’t extent to priority treatment once of I-90 at least for the 545. I think a lot of routes that have pseudo BRT characteristics have come together as the result of incremental improvements when the opportunity arose, not a concerted effort to build specific BRT routes. Right now, at least from the last time I drove there, the HOV lanes on 520 are bus-only. Isn’t that the definition of BRT? Anyway, this is my point. You have one definition of BRT, I have another. The so-called BRT proponents that Martin is saying are being insincere may have yet another. This boils down to the logic. Martin’s definition of insincerity means the support of a specific definition of BRT. 1) I can strongly support my definition and be both sincere and consistent in my support of my BRT, but my definition is different from Martin’s. 3) I can say I support some definition of BRT, but then keep weakening my definition of it as you compromise (this may be a sub-form of ‘2’). In my opinion, 2 or 3 count as real insincerity. 1 doesn’t, because I support express buses and I support calling them BRT, but whole-heartedly oppose building massive busways of the type they have in LA. BRT is a continuum of service attributes, but it doesn’t mean anything someone wants it to mean. Otherwise, “BRT would be better at X than rail” is an absolutely empty statement. At a minimum, it has to be “rapid.” I don’t see how one could possibly construe the bus priority treatments in Proposition 1 as being somehow outside the scope of BRT. Ah, yes, but now this is an argument about seriousness. I don’t think there’s much you can do about that. If I want to believe all rail is always a bad idea, then I might just think that and make wild arguments about BRT being magical. You can be sincere and also be completely wrong. But “once it gets on the freeway” is only half the time – or less – that the trip takes. Getting on and off at Montlake or Capitol Hill is nice, but if you live downtown, Stewart can take as long as the rest of the trip to MS. Yes, then Rapid ride B isn’t BRT, because it’s slower than that through most of it’s route. I support more rail, in Seattle, I am not even sure how much I support more buses (I certainly don’t support less buses, but the money is better used for rail in the long-run), but I don’t think that makes me anti-brt or something. I experienced this firsthand on the way to our last meetup. The 545 took a full hour to travel from Overlake to the center of downtown, a good 20 minutes of which was within downtown. When completed, East Link will accomplish that same trip in half the time. Also trains tend to be more roomy, and more comfortable… along with the better ride I suspect that’s why people tend to prefer them to buses even if the latter are operated in a train-like manner ala BRT. “Choice” riders overwhelmingly prefer rail over BRT, all other things being equal. There’s a large segment of the population who would never willingly set foot on a bus, but who are willing to give trains a try. Well, choice riders in the US prefer rail. In some European countries I hear, riders are indifferent to the mode, and don’t understand why we’re such rail snobs. But those countries have a very different transit system, with one agency handling all modes, and a common ticket for all of them, and wider bus stop spacing, and rail wherever capacity is needed rather than where one agency has jurisdiction or where a freeway is located. (And the freeways are often built alongside existing rail lines that still have passenger rail service.) So the difference between bus and rail there is less. Why would grant funding prevent CT from cutting other service to further subsidize Swift operations? Worth noting that Van Dyk paints Prop 1 as being a streetcar measure, apparently blind to its bus (and bike and pedestrian) improvements. Also interesting to note that he implies that the first version of ST 2, part of the roads & transit measure, failed in 2007 because of a lack of youthful voters drawn to the 2008 election. That may be true but wasn’t at least part of the failure of Roads & Transit due to the Sierra Club coming out against it as well as the “Ron Sims” moment? I’d argue that the voters are pretty clear about wanting a lot more transit options even if critics would say that they don’t know what they are actually voting for. The $18 million devoted to streetcar studies was probably a net liability for Prop 1; the opponents often cite it; the proponents ignored it. This string neglects two key variables in the LRT v. BRT debate: rights-of-way and budget. What Martin says about BRT is true: it can achieve a continuum of qualties depending upon the degree of grade separation and service frequency. the same is true of LRT. both grade separation and frequency are costly. Velo: yes, there were many flaws in the 2007 joint ballot measure; among them was the use of a tenth of sales tax to fund many miles of untolled limited access highways. I supported the Sierra Club, Cascade, and Sims negative position. What if the cost of a single LRT line was the same as the cost of several BRT lines?